gives the inverse hyperbolic tangent of the complex number . For certain special arguments, ArcTanh automatically evaluates to exact values. ArcTanh can be evaluated to arbitrary numerical precision. ArcTanh automatically threads over lists. ArcTanh[z] has branch cut discontinuities in the complex plane running from to and to . 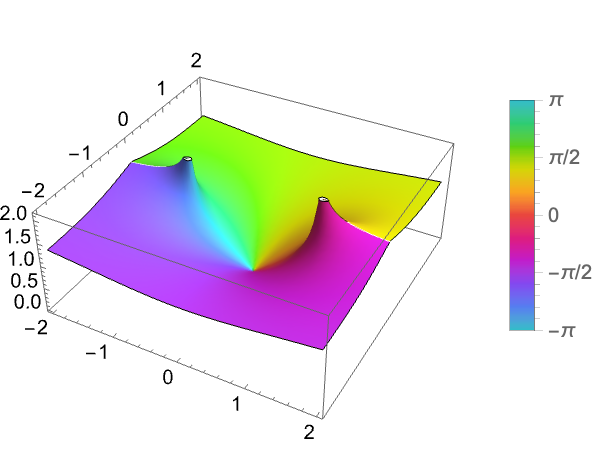 ArcTanh is the inverse hyperbolic tangent function. 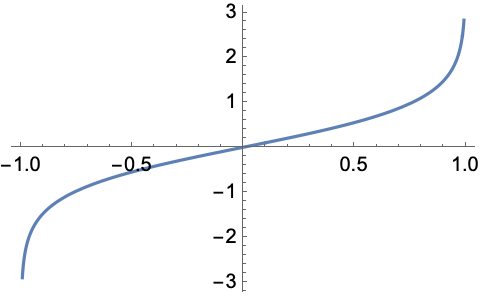 For a real number x, ArcTanh[x] represents the hyperbolic angle measure such that . ArcTanh automatically threads over lists. For certain special arguments, ArcTanh automatically evaluates to exact values. When given exact numeric expressions as arguments, ArcTanh may be evaluated to arbitrary numeric precision. Operations useful for manipulation of symbolic expressions involving ArcTanh include FunctionExpand, TrigToExp, TrigExpand, Simplify, and FullSimplify. ArcTanh is defined for complex argument by . ArcTanh[z] has branch cut discontinuities in the complex plane. Related mathematical functions include Tanh, ArcCoth, and ArcTan.